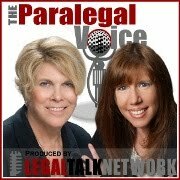 The current edition of The Paralegal Voice, “The Latest in Court Technology for Paralegals” co-hosted by Lynne DeVenny and me, is now available at Legal Talk Network. Ted Brooks, Founder & CEO of Litigation-Tech LLC for his insight regarding the latest in court technology for paralegals. He provides tips for paralegals getting ready for a big trial using extensive technology in the courtroom and explains how paralegals can learn the basics of commonly used trial software. Ted also gives his picks for blogs and online resources for paralegals interested in learning more about courtroom technology. The Paralegal Voice also thanks its sponsors: Redact-It, and NALA...The Association of Paralegals and Legal Assistants.